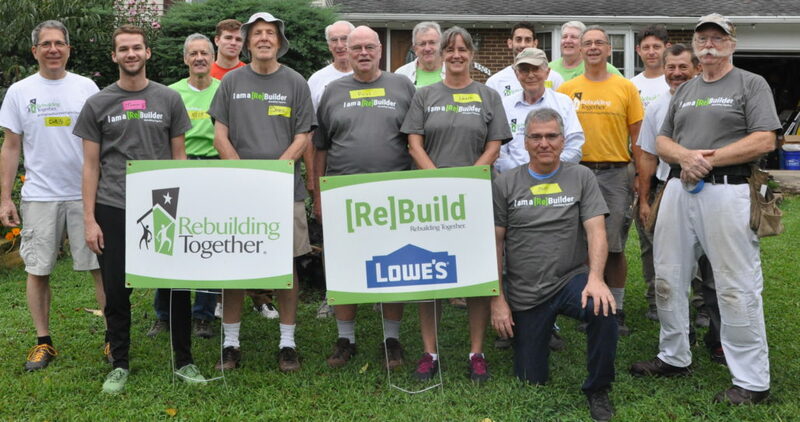 “This is one of the first times we’ve felt a sense of community in our neighborhood,” said Mrs. A as she watched the team of Rebuilding Together-AFF volunteers working on projects all around their Alexandria home. She and her husband have worked hard at their jobs so they can provide a solid foundation for their 10 children. Their eldest son, serving in the army in Afghanistan, sent a message to the volunteers. “Thank you for being there and helping my family. I’d be there with you if I could.” Their second oldest, a daughter, has graduated from college – an accomplishment they are very proud of. She lives in Miami and is looking for work in her field. The family lives in a small split level home with their 8 younger children who range in age from 5 to 19. The A’s worked hard to buy the home and provide a nurturing environment for their family, but two years ago Mr. A had a serious health event that compromised his ability to repair and maintain their home, something that he had proudly done his entire life. The basement had flooded several times, their water and gas bills were sky-high and there were nagging repairs and tasks that Mr. A couldn’t complete. 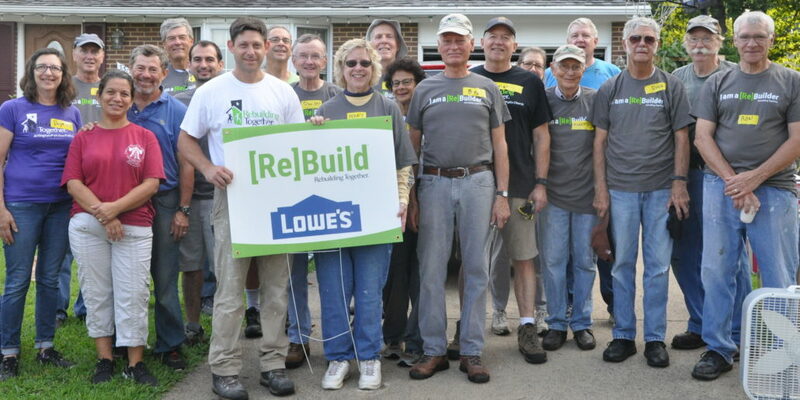 The family was incredibly grateful when they learned that Lowe’s was providing a grant to RT-AFF to complete their repairs. It meant that they would get new energy efficient windows and a new sliding glass door to keep the drafts out and cut their heating bills. The volunteers corrected water intrusion and moisture issues to prevent further health hazards to the family. Dirt was added to change the grading so water moved away from the foundation. 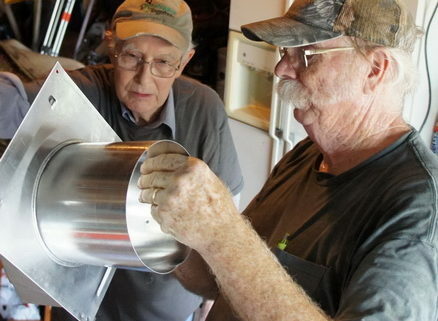 An earth berm and drainpipes were also installed, and downspouts and gutters were repaired and modified. 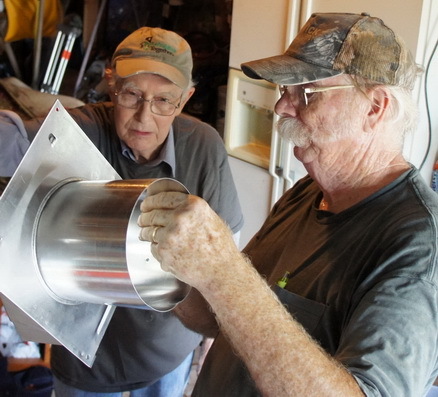 Two old toilets were replaced with water-saving models, and the broken sump pump was repaired. The work the volunteers completed also included repairing and painting drywall, installing new flooring in the kitchen to replace the worn sheet flooring that was cracked and peeling, and adding an exterior vent to the stove hood to carry kitchen fumes out of the home and keep the indoor air cleaner. Eleven health and safety priorities were addressed by the volunteer team over two days. The A family’s home now meets all 25 health and safety priorities that Rebuilding Together uses to evaluate the success of our projects. Check out our Flickr albums for the two workdays: Day 1 and Day 2.